To a Jew this role of the Jewish leaders in the destruction of their own people is undoubtedly the darkest chapter of the whole dark story. Among the many horrors of the Holocaust were the Judenräte, Jewish administrative councils set up under the aegis of Nazi Germany’s occupation of Eastern Europe. Typically recruited from local elites and granted special privileges by the Germans, these collaborators managed the day-to-day operations of the ghettos, up to and including the horrible sharp end of Final Solution: confiscating Jewish property for the Germans, registering and organizing Jews destined for slave labor or extermination, and even managing deportations with the desperate hope that willingly engaging a sacrifice they could never prevent might enable them to save some others. Once all the deportations were done, the Judenrat itself would be executed or deported: Faust had nothing on this bargain. Rumkowski, a deeply checkered figure who fended off liquidation of his ghetto until the very late date of 1944, well knew that Judenrat personnel were entirely disposable. After all, he delivered this plaintive speech on September 4, 1942 — just three days after his counterpart in the Lvov Ghetto had been publicly strung up on a balcony. Six Jews (including Henryk Landsberg) hanged in the Lvov Ghetto, September 1, 1942 (via). 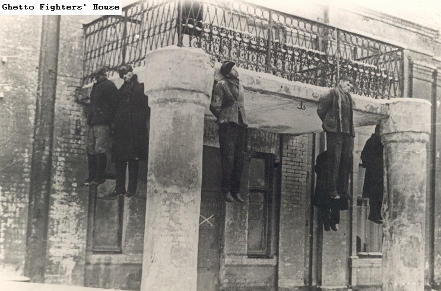 The US Holocaust Memorial Museum also identifies this clearly distinct execution as a picture of Lvov Jewish Council members being hanged in September 1942. The city of Lwow/Lvov (or to use its present-day Ukrainian spelling, Lviv) had had a centuries-old Jewish population when the Soviet Union seized it from Poland in consequence of the Molotov-Ribbentrop pact. That population almost immediately doubled as Jewish refugees fleeing the half of Poland that Germany got in the deal poured into the city. Practically on the frontier of the German/Soviet border, Lvov was captured in the opening days of Germany’s June 1941 surprise invasion of the USSR. In November-December 1941, the 100,000-plus Jews* still surviving in Lvov (after several post-conquest massacres) were crammed cheek to jowl into the new Lvov Ghetto. There they endured the usual litany of privations for World War II ghettos: starvation rations, routine humiliation, periodic murders. forced labor at the nearby Janowska concentration camp. The ghetto’s first chairman, Dr. Josef Parnas, didn’t live to see 1942 before he was killed in prison for non-cooperation. Dr. Adolf Rotfeld followed him, and died of “natural” causes in office a few months later. Dr. Henryk Landsberg, a lawyer, succeeded Rotfeld. He had been a respected community figure before the war, but was disposable to the Nazis as his predecessors; during a large-scale Aktion to cull the camp and further reduce its boundaries, a Jewish butcher resisting the SS killed one of his persecutors. Landsberg and a number of the Jewish policemen employed by the Judenrat were summarily put to death. The Lvov Ghetto was liquidated June 1, 1943; a bare handful of its former inmates escaped into the sewers or managed to avoid death in the camps before the war ended. After the Red Army took back the city, a 1945 survey of the Jewish Provisional Committee in Lvov tallied just 823 Jews. Today, there are all of 5,000. * Among the Lvov Ghetto residents was Simon Wiesenthal.